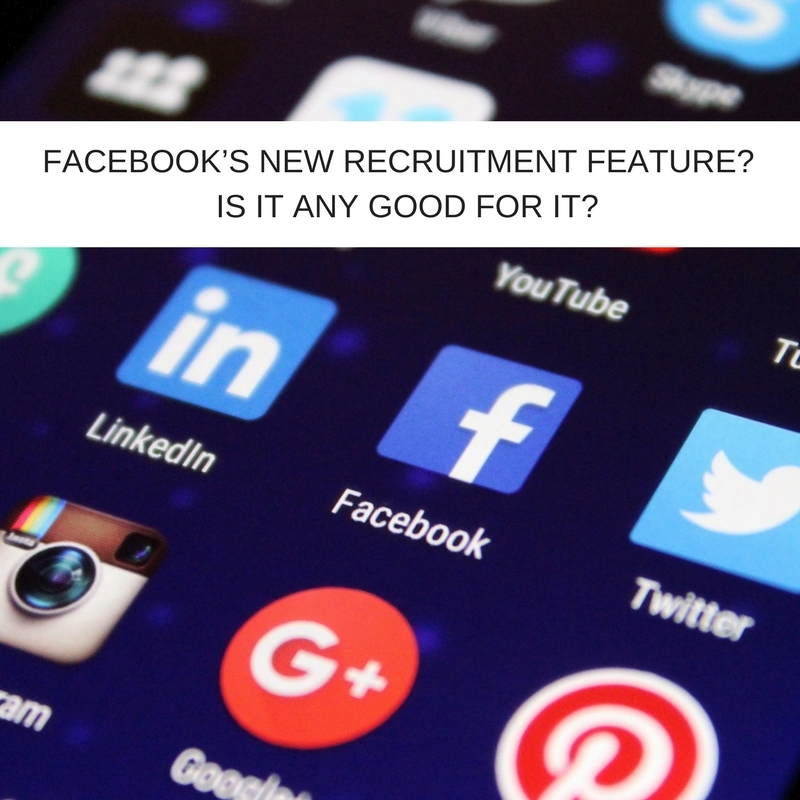 Home / Business Requirements / Is Facebook’s New Recruitment Feature Any Good for IT? So Facebook appears to have taken on LinkedIn with its new job ads feature – but is it any good? As I write, “Facebook Jobs” has launched in the USA and Canada but anticipate a global roll out before too long. As you would expect, Facebook has made it as easy as possible for both hirers and job seekers to use. Via your business Facebook page, you will be able to post and host job ads in much the same that you currently create status updates. Furthermore, candidates will then be able to see all vacancies that your company has (providing you’ve posted them on Facebook). Thinking about the way Facebook users like and share content and tag friends that they think may be interested, it’s amazing that it has taken Facebook this long to dip its toes into recruitment. However, given that delay, I’m surprised it’s not a little more ground-breaking. What is interesting is the “Apply Now” button. When candidates click it a partly pre-filled form opens with all the information that you shared with Facebook when you opened your account. So things like your name, email address, mobile number and any education and employer history from your profile are already filled out leaving you time to concentrate on the 1,000-character summary of why you are the best candidate for the gig. Thing is, though, you want to make it easier for the perfect candidate to apply for your position, not hundreds of unsuitable ones. The truth is that both LinkedIn and Facebook will allow you to focus your recruitment to specific job roles so adverts will be more targeted than some other recruitment tools but when you are hiring specialist IT talent, like Project managers, you need more. For instance, profiling of applicants by people with specific Project and Programme expertise will yield better matches. Also, neither Facebook nor LinkedIn professes to be great at matching candidates and business cultures which also matters when you are hiring for a role that is key to your business strategy. I did also have a concern about the size of the Facebook audience. Facebook has 1.86 billion monthly active users (Q4 2016). Now, if your job ad gets shared in the way that Facebook posts often are your vacancy may end up in a lot of news feeds. This is great if they’re all accounts belonging to specialists in the field you’re recruiting – but what are the chances? More likely you could end up with a lot of unsuitable applicants hitting that ever so easy to use “Apply Now” button. This fear has been slightly allayed by early response to the feature. To be fair, Facebook makes no secret of the fact that, at the moment, it’s not seeking to break the specialist recruitment markets with its new job ads feature but this hasn’t stopped recruiters in the US and Canada having to field questions from clients. One told me that he’d had a client ask him to justify his firm’s charges given that Facebook job ads would cost a fraction – I forwarded him this quote. Jonathan Duarte, CEO of GoHire, Inc. told Forbes.com he knows of three companies that recently posted jobs, spending $100 to increase visibility but only received messages from, at best, three applicants. “An equivalent spend on another pay-for-click job board, would have resulted in over 100 responses,” he says. So $100 down the drain in these cases. Whereas the better specialist recruiters offer no-risk cost models – many not charging if a search yields no suitable candidates and some even extending their attitude to risk sharing beyond you hiring someone they recommend well into the first year of employment. Will Facebook job ads be a threat to LinkedIn or other recruitment channels? Maybe. Will it be a threat to recruitment businesses? Perhaps, but the more niche or specialist a role is – the less effective tools like this are. Businesses will try it. That’s what Facebook will be hoping. Most of Facebook’s 1.86 billion users get it for free and as with if anything that’s free – someone is paying somewhere. In Facebook’s case, it’s businesses, of the 60 million business pages, something like 4 million actively advertise. Facebook jobs is a neat piece of low-hanging fruit to be harvested. The question you have to ask … as you should with any recruitment partner … will you get the bang for your buck?